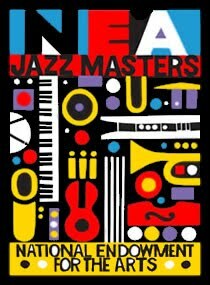 On Thursday, the NEA announced the winners of the 2011 NEA Jass Masters Award: flutist Hubert Laws, saxophonist/flutist/composer David Liebman, composer/arranger/trumpeter/trombonist Johnny Mandel, jazz producer/author Orrin Keepnews (winner of the award for jazz advocacy), and the Marsalis family: pianist/educator Ellis Jr., saxophonist/composer/bandleader Branford, trumpeter/composer/educator/bandleader Wynton, trombonist Delfeayo, and percussionist/vibraphonist Jason. I don't get the family award. (Lois Gilbert of Jazz Corner put it this way: "I'm kind of surprised at an all encompassing Marsalis family honor being named 2011 NEA Jazz Masters.") I agree that the Marsalis family has been and is important to jazz. Although each has occasionally said or done boneheaded things (except, maybe, for father Ellis), I'm not a Marsalis basher and never will be. But--Jazz Masters? The National Endowment for the Arts Jazz Masters Fellowship is the highest honor that our nation bestows upon a jazz musician. Each year since 1982, the program has elevated to its ranks a select number of living legends who have made exceptional contributions to the advancement of jazz. For the NEA Jazz Masters, the selection criteria are artistic excellence and significance of the nominees' contributions to the development and performance of jazz. The Arts Endowment will honor musicians who represent a range of styles and instruments. These awards will be categorical, e.g., a rhythm instrumentalist, pianist, solo instrumentalist, vocalist, and an arranger or composer. Why not honor Ellis as paterfamilias, performer, composer, and educator? Although "educator" isn't one of the categories, and neither is "paterfamilias." I'm not saying that Ellis doesn't deserve to be honored and respected. But is he a Jazz Master? Wynton and Branford, one day, yes. Right now they seem kind of young to wear the Jazz Master hat. Delfeayo and Jason? Waaaay too soon to tell. I'm not sure what the "family" award says about the Jazz Masters program. Currently this leads every story about this year's awards. "America's first family of jazz can now claim the nation's highest jazz honor" (AP). Most egregiously: "The patriarch of the first family of New Orleans jazz, Ellis Marsalis, will be honored along with his four sons as Jazz Masters by the National Endowment for the Arts...Three other artists also will be honored..." (WWLTV). We learn who the "three other artists" are at the very end of the article, almost as an afterthought. Let's hope the spotlight doesn't stay on the unusual "family" award while Laws, Liebman, and Mandel (and Orrin Keepnews) are left in the shadows.